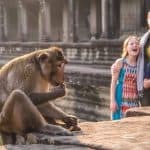 Traverse City is quickly gaining more popularity as one of the top family-friendly destinations, not only in Michigan and the Midwest, but the entire nation – and for a good reason. With an ideal location in northern Michigan located right by the water, miles and miles of beaches to explore, water activities, fun family activities, and exciting events- what’s a family not to love? 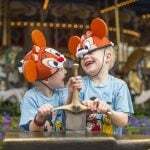 Although there are hundreds of kid-friendly activities to explore with kids, take a look at our family’s top 5 picks. In fact, we’re positive you’ll have a wonderful time in the Cherry Capital of the World that we’ve partnered with our sponsor Grand Traverse Resort and Spa to offer you a 2 night family-friendly stay perfect for your Traverse City getaway. Read on for more details! There’s a good reason why Traverse City is named the Cherry Capital of the World – it produces over 75 percent of the world’s tart cherries which not only means tons of cherries, but tons of cherry trees. Can you imagine 2 million cherry trees blossoming amongst the gorgeous blues of the waters? Luckily, during our visit at the end of May, we were still able to see some of the cherry blossoms on our drive through the picturesque and beautiful Leelanau and Old Mission Peninsula. To completely immerse yourself in all things cherries, a visit to the National Cherry Festival is a must. The weeklong festival features over 150 family activities with highlights that include air shows, fireworks, midway rides, outdoor concerts, and of course cherry-pie eating and pit-spitting contests! It’s no wonder why it was named one of the 10 Best Festivals by USA Today. Even if your travels do not bring you to Traverse City during the Cherry Festival or cherry season, all things cherry can be found year round at Cherry Republic. For the ultimate experience visit the Glen Arbor location of Cherry Republic’s tasting room where the whole family can taste test different flavors of cherry flavored soda (or pop as its known around the area), and mom and dad can try out the cherry wine. My personal favorite was the cherry ginger ale, and my only regret was not buying more to bring home. Don’t forget to stop by the store and restaurant for more cherry goodies – cherry chicken salad sandwich, cherry pie, and of course cherry ice cream awaits you. Mark your calendars for next year’s event slated from July 5 – 12, 2014. 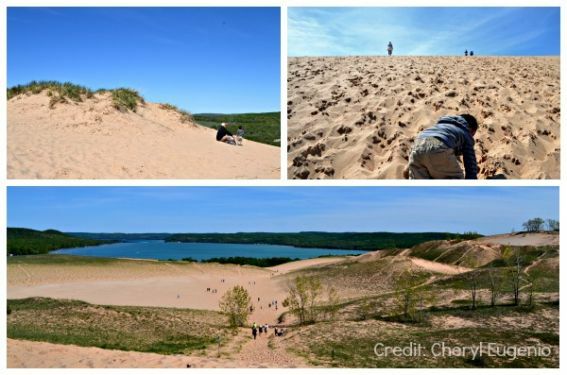 Venture less than an hour away where the ultimate day trip awaits you at the “most beautiful place in America,” Sleeping Bear Dunes. You can easily spend the day there, but if you’re short on time, make it a mission to conquer The Dune Climb up about 300 feet. If you’ve made it this far, and if you’re up to the challenge, take the two mile hike up to the top where you’ll not only revel in sweet satisfaction, but you’ll be rewarded with breathtaking views of Lake Michigan. And if you don’t make it to the top, the climb (or run) down will surely be memorable. Read more tips on how to conquer The Dune Climb! Michigan boasts 115 lighthouses, more than any other state, and the Traverse City area does have their fair share of these iconic treasures. For a glimpse into the past a visit to a lighthouse is a must. Luckily, there are two main lighthouses that dot the Traverse City region. 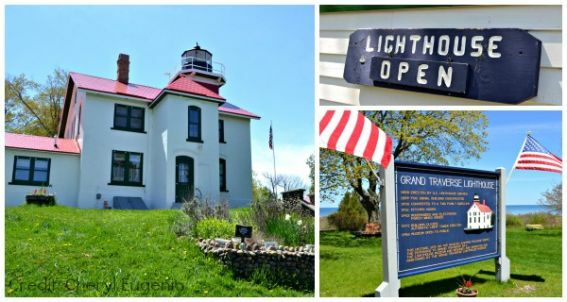 Make your way to the Grand Traverse Lighthouse Museum, a former lightkeeper’s home that now serves as a museum with artifacts dating from the 1920s. 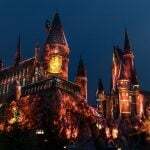 During the summer time, stay after dark with the family and catch a movie. If you’ve ever wanted to say you’ve been halfway between the North Pole and the equator, take the picturesque drive down M22 road through Old Mission Peninsula until you reach the end of the road and your destination – Mission Point Lighthouse. A fair warning on whichever lighthouse you choose: the climb up the stairs and ladder will be tight and more difficult for the young kiddos, but will be worth it once you set your eyes on the magnificent views. 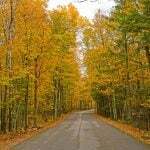 Interested in more attractions located on the Sunset Coast of Michigan? See this list for more fun ideas! 2. Go to a beach – any Beach! With over 181 miles of shoreline on Grand Traverse Bay and Lake Michigan, Traverse City has no shortage of beaches with sugar fine sand. Your main problem will be deciding which one to go to! For city beaches close to downtown, head to Clinch Park, and Bryant Park. 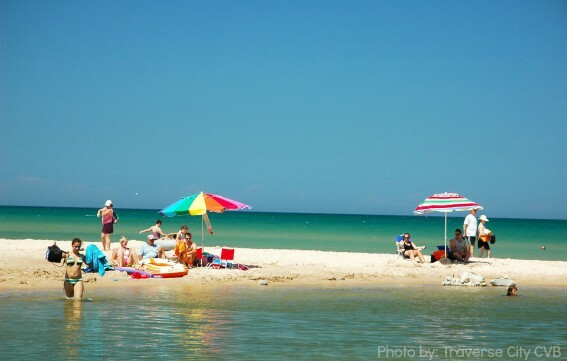 If you find yourself at the Old Mission Peninsula, head to the beach families and locals love – Haserot Beach. Afterwards, stop by the funky Old General Store for ice cream. When Mother Nature puts a damper on your beach plans, arm yourself with a Plan B and enjoy a few indoor activities that will make the time equally enjoyable. 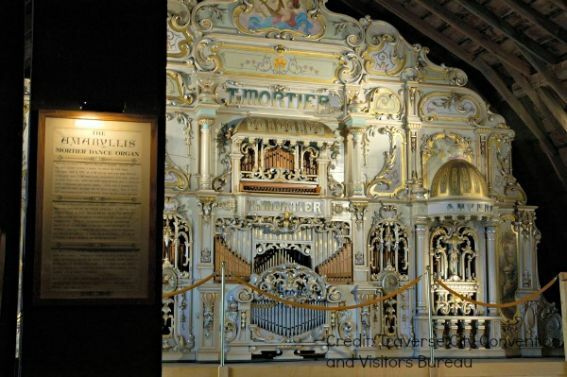 Visit the unique gem, the Music House Museum, that showcases rare and antique musical instruments of the past. Should you time it right, join a tour where you can hear the music being played from these instruments. For a change of pace where hands-on fun is encouraged, the Great Lakes Children’s Museum will keep your children of all ages busy by pretending to be a Lighthouse Keeper, or learning about free-flowing water at the water table. 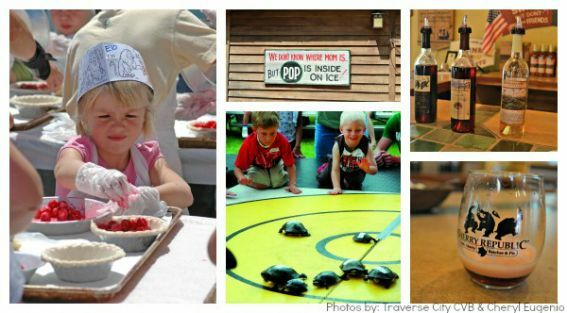 What’s your favorite Traverse City activity? We’d love to hear about it! Ready for your very own Northern Michigan getaway in Traverse City? Now’s your chance! Enter to win a stay at The Grand Traverse Resort and Spa, a 900 acre resort, with something for everyone in the family. With three golf courses, a full-service spa, a water playground, their own private beach, a shopping area, and access to as many sweets as you want at Dylan’s Sweet Candy Bar and Café, you’ll never need (or want) to leave! Watch this video to learn more about Grand Traverse Resort and Spa. Sounds like a beautiful town and fun-filled resort! Good luck to all of the giveaway entrants! Technically, you drive north on the picturesque M-37 on Old Mission Peninsula… not down M22. Another great rainy day plan should include the Dennos Museum, on the campus of Northwest Michigan College, just down the street from Bryant Park. Besides the grown up exhibits, which include a large collection of Inuit sculpture, there is a special exhibit each summer. This year it is Birds of Paradise. Not to be missed is the children’s section, a place to explore, to touch, hear and watch. There’s a nifty light/shadow wall which is mesmerizing, a harp you can play, with no strings and a lot more. And of course there is a museum store chock full of all kinds of cool stuff, with a wide range of prices. then there’s the History Center of Traverse City, housed in the former (Carnegie) library building. Here too there is a special summer exhibit, and for the past 2 or 3 years, it’s been LEGO’s. Lots of displays, some interactive, and blocks for building. Not to be missed is the terrific museum housed here, which includes a cherry pit bin. This has clear sides, and is filled with about 2 feet of clean dry cherry pits. Kids have a ball searching for arrowheads (they can keep one) and just diving around the pits. There are a few chairs for tired parents to sit and wait. 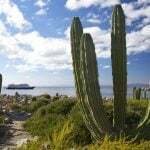 I’m a big fan of TC–it’s my hometown and my favorite vacation locale! Don’t forget the Boardman Nature Center! Fun hands on exhibits.